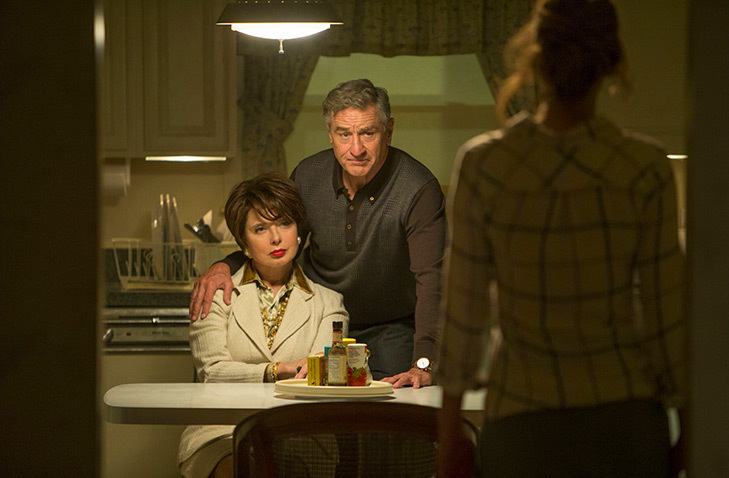 Much has been made over the fact that “Joy” represents the third entry in the increasingly excellent collaboration between Jennifer Lawrence and David O. Russell, but as audiences will soon learn when the movie begins rolling out in select theaters on Christmas Day, the drama truly belongs to co-star Isabella Rossellini. At age 63, the actress forcefully steals scenes left and right not only from Lawrence, but also from fellow Russell stalwarts Robert De Niro and Bradley Cooper. Rossellini is all kinds of tough and transfixing in the role of Trudy, De Niro’s new lover with enough money to fund Joy’s dreams of creating the miracle mop. The role was a pivotal one to cast for Russell, mainly because its real-life inspiration was part of the reason he decided to tackle the story. Joining Rossellini after a special screening of “Joy” at 92Y in New York City as part of Annette Insdorf’s Reel Pieces series, Russell revealed that Trudy is actually based on the real late-in-life romantic interest of Miracle Mop creator Joy Magano’s actual father. The two met using a dial-up matchmaking service over the phone (the original “Match.com,” as the director put it) that paired widowers together for dates, and it was on her boat where the real Joy cut her fingers while mopping up glass, laying the foundation for her breakthrough home invention. Russell needed someone “continental” for the part, an actress who could be “tough” while still carrying an “elegant air,” and Rossellini had all of these qualities and more. In her hands, Trudy becomes the standout character of the lot, but her feistiness and intimidating glare didn’t come as naturally to Rossellini as one might expect. She credited Russell’s singular directing style as allowing her to access the sharper sides of her character. Even more admirably, she revealed Russell’s filmmaking style reminded her most of her father, the esteemed Roberto Rossellini. She later continued this musical theme when talking about how Russell’s process with actors is both “inside out,” in which the actor explores the character from their internal emotions, and, unusually, “outside in,” in which Russell gives direct line readings over and over again to help the actor find the character. “With David, there were moments that I discovered where I’d say, ‘David, just tell me the line you want me to say,’ and he would deliver the line and I would copy it. I found that in the rhythm that he was giving me, like music, there was emotion. I would repeat three or four times what David gave me, and just by the rhythm of the delivery you found the emotion.” For Russell, the music and rhythm of how someone talks is the character, and clearly his methods work, given his amazing track record of getting actors to the awards podium. For more from Russell and Rossellini’s 92Y conversation, including the ways in which Russell reshaped the original draft, check out the video below or head over to 92Y On Demand.